Part 5. (1998 through 2000) The cover price is US$30.00. This book contains 134 pages. A simple, low-cost visible light spectrometer, consisting primarily of a video camcorder and an inexpensive diffraction grating, was assembled and found to be of use in work to improve colored pyrotechnic flames. This instrument is all that is needed to collect and store useful, qualitative flame color information. With this simple instrument, the nature of color agents and the sources of interfering chemical species can be determined. If semi-quantitative data is needed, a video frame grabber and personal computer can be employed. These allow more accurate identification of wavelengths of spectral features (lines and bands). It also makes possible the determination of relative intensities of spectral features. If quantitative intensity data is needed, a suitable calibration source is necessary and calibration corrections must be applied to the intensity data. In a brief study using the video spectrometer, it has become clear that much of the difficulty in achieving high quality green and blue colored flames is often the result of impurities present in the raw chemicals. Specifically, the presence of sodium and calcium can act significantly to shift green flame colors toward yellow and blue flame colors toward white. A brief series of measurements were made on the flashes produced by a simple glitter formulation. In part this was done as a test of one theory for the chemistry of glitter. However, this was also done to produce some intrinsically interesting data that have not been previously reported. It was observed that both increasing the percentage of aluminum in the formulation and decreasing the particle size of the aluminum, decreased the delay time before the appearance of the glitter flashes. Both the size and duration of glitter flashes increased for flashes with greater delay. It was also observed that there was a rapid increase in temperature just prior to the onset of the flash event. Reprint Information: Number of pages = 4. Download for free pp 446-449. I recently needed an estimate of the amount of lift powder that would have to be missing from a spherical aerial shell, for it to remain in its mortar upon firing. Since that apparently has never been reported in the literature and because it was easy to determine, a brief study was conducted to discover this. Although there is little reason for the typical pyrotechnist to need the answer to this question, nonetheless it is a somewhat interesting number; thus, the motivation for this short article. Reprint Information: Number of pages = 1. Download for free p 450. Although concussion mortars have been used for many years at band concerts and in theatrical performances, there has been relatively little investigation of the effectiveness of their basic design. Measurements of the effect of two modifications of the design of concussion mortars indicate that significant improvements in their performance were achieved; however, only for light powder loads. Though somewhat disappointing, these designs may be of use in situations where increased loudness of report is needed without an increase in smoke production. Measurements were also made of the effect of loading materials (whether inert, a fuel, or an oxidizer) on top of a commonly used concussion powder. It was found that all of these produced increased sound output. However, this seemed to be mostly the result of added confinement of the concussion powder. Several factors affect the burning of quick match. A brief study was conducted to determine the general magnitude of the effects produced by those factors, singly and in combination. For high quality quick match, under the conditions of these tests, it was determined that tight string ties, damage to the Black Powder coating and exposure to high humidity had the potential to slow the burning of quick match. However, no single performance risk factor was observed to be sufficient to produce either a significant hang fire or a failure of the quick match to propagate. To the contrary, however, typically a synergistic effect was produced by combinations of risk factors. For example, combinations of two risk factors produced short hang fires, and combinations of all three risk factors produced occasional misfires. An examination of the extent to which moisture is gained by the materials used to make quick match suggested that the use of synthetic (plastic) string could significantly reduce moisture adsorption. This should reduce the degradation of the performance of quick match that has been exposed to high humidity. Also long duration hangfires could possibly be eliminated because this string does not tend to smolder like cotton string. Finally, there was a brief examination of the time taken for the strings in black match to lose their strength after the flame front had passed. It was found that it may occasionally be possible for one shell firing in a chain to pull apart the fusing of the next shell in the series. Reprint Information: Number of pages = 15. If a pyrotechnic item fails to ignite when intended, it is a failure. It makes no difference that had it ignited; it would have produced a spectacular display or a life-saving distress signal. Primes and priming techniques are important in producing high quality pyrotechnic effects, because it is through their use that reliable ignition can be achieved. In this review article, after presenting some basic information, propagation energy diagrams are explained and used to discuss the role and manner of functioning of pyrotechnic primes. In the course of the discussion, a number of ignition and propagation problems will be investigated and solutions demonstrated. The article concludes with a discussion of some basic prime formulations and methods for their application. Reprint Information: Number of pages = 16. There are potential hazards and some level of risk resulting from those hazards associated with all human activities. When the risks are below an acceptable level, those activities are generally considered safe. The hard part is not the estimation of risks; there are relatively simple methods to estimate risk. Rather, the hard part is determining what is an acceptable level of risk for an activity. For the most part, this article only addresses the easy part, discussing the relative risks of dud shells falling into spectator areas for different scenarios. The reader is left with the hard part, deciding what level of risk is acceptable and what (if anything) to do about those risks for their displays. The previous article on this topic discussed the general process by which one performs a risk assessment and then applied it to two fireworks display scenarios. One scenario had mortars of the same size together in groups, with each group located at their pre-1990 minimum National Fire Protection Association (NFPA) separation distances. (See Figure 2 of the previous article if needed.) The second scenario had the same mortar groupings, but this time, each group of mortars was located at their post-1990 NFPA distances. The estimated relative cumulative risks for the two scenarios were 550 and 40, respectively. Accordingly, for these scenarios, the new NFPA separation distances should produce more than a 90% reduction in the risk of dud shells falling into spectator areas. A sample of Black Powder dating to the time of the US Civil War (ca. 1863) was harvested from cannon balls uncovered during an excavation on what had previously been the grounds of the Allegheny Arsenal near Pittsburgh, PA. A portion of this powder was eventually made available for an investigation of its properties. It was found to be in excellent condition, both physically and in its performance. Physically, it is essentially indistinguishable from high quality Black Powder of current production. Its performance under conditions replicating its normal use was only slightly less than that produced by a high quality powder of current production. There is a new style of black match used to make the quick match leader fuse on some Chinese products. The fuse has recently been found on some Flower Basket aerial shells and Lidu display fireworks boxes and may also be used on other items as well. While this new black match seems to function well in quick match, it has one characteristic that is important to note for safety reasons. Where normal black match tends to burn rather slowly at about an inch per second, this new black match burns very much faster, perhaps as fast as quick match (roughly 10–20 feet per second). Because of this much faster burn rate, it is possible for someone to have a serious problem. For example, if the end of a shell leader fuse were damaged, someone might attempt a repair by cutting off some of the damaged shell leader and then exposing a few inches of this new black match. In this case, the person may have the expectation that lighting the tip of the newly exposed fuse would provide a few seconds before the item would function. However, instead, the fireworks could begin to function essentially immediately upon ignition of the tip of the leader fuse. Internal mortar pressures were measured for a range of somewhat typical fireworks aerial shell firing conditions. These data were used to determine the peak shell accelerations produced during firing. Under the conditions investigated, peak aerial shell acceleration ranged from approximately 4 to 16 km/s2 (400 to 1600 times the acceleration due to gravity) and appeared to be mostly independent of nominal shell size. As a check on the acceleration results, the same mortar pressure data were used to calculate aerial shell muzzle velocities. These were found to be in close agreement with measured velocities. For maximum effectiveness of tightly choreographed fireworks displays, it is important that shell bursts occur very near their intended times. Two main sources of variation combine to affect the overall precision of the shell bursts. First is the preciseness of the shell firings; second is the preciseness of the time fuse burning. Other than by purchasing high quality shells, a display company generally has little control over the precision provided by the shell’s time fuse. However, the display company can do much to control the firing precision for those shells. For the most part accurate firings are only possible using electrical ignition. For the purposes of this article, it is assumed that a computer or other means of accurately applying the firing current to electric matches (e-matches) is being used. This leaves the question as to the degree of firing precision achieved using various methods of attaching e-matches to shells and is the subject of this article. Sticky Match® is an expedient and reportedly effective type of fuse, especially useful in fusing lance set pieces. However, some users have mentioned an apparent tendency for the fuse to burn noticeably slower at low temperatures. The authors conducted a brief investigation of Sticky Match burn rate as a function of temperature. The study was conducted over a temperature range from approximately –30 to +40 °C (–20 to 100 °F). In what is likely to be its normal method of application, it was found that at the lowest temperature Sticky Match burn rate fell to as little at 1/3 that at the highest temperature. Using a slightly different method of application, it was found that its burn rate was even more strongly affected at both extremes of temperature. In a third and substantially different method of application, it was found that Sticky Match was essentially unaffected by temperature, but always burned rather slowly. As a comparison to Sticky Match’s temperature performance, the study also characterized the effect of temperature on the burn rate of conventional quick match. 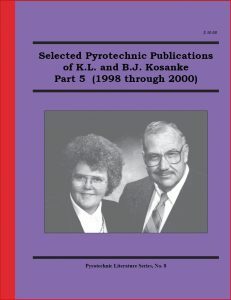 In two configurations, similar to those used for Sticky Match, it was found that the burn rate of quick match was virtually unaffected by temperature. Rarely is there only one mitigation strategy to reduce the level of hazard posed by a problem. This concept is explored in the context of alternate strategies for limiting the potential problem posed by fireworks mortar bursts within troughs and drums. This begins with a discussion of the nature of the mortar burst problem and the current National Fire Protection Association (NFPA) requirements for using mortar troughs. This is followed by a discussion of a series of alternate mitigation strategies that are thought to provide equivalent spectator protection. Based on the experience of a small fireworks display company with several low-breaking aerial shells, it was speculated that the cause might be related to having modified the aerial shell ignition system. To evaluate this possibility the effect of various levels of ignition stimuli on the performance of aerial shell Black Powder lift charges was briefly investigated. The purpose of the study was to scope the nature and magnitude of any resulting effects. Armed with that information it would then be possible to better design a more extensive study if needed. Three levels of ignition stimuli were used: hot-wire igniters, electric matches, and fireworks quick match. Using identical test shells, upon firing, no statistically significant differences were found in their times of flight and mortar pressure impulses. Thus, either the low breaks were the result of something unrelated to ignition stimulus, or the statistically small number of trials was not sufficient to identify the effect. The morphology (size, shape and surface features) of the constituent particles in a pyrotechnic composition affects its performance. This is particularly true of metal fuel particles in the composition. Particle morphology can also constitute an important part of forensically establishing a match between materials of known origin and evidence. This article catalogs and briefly discusses some characteristic features commonly associated with metal fuels in pyrotechnic compositions. The Pyrotechnics Committee of the National Fire Protection Association (NFPA) recently revised the Code for Fireworks Displays, NFPA 1123. The revised code included recommendations for wall thickness for fiberglass mortars and for larger sizes of high-density polyethylene mortars. In anticipation of the committee’s discussions of the needed strength of mortars, the authors decided to assemble data on typical peak mortar pressure as a function of aerial shell size. Because of the limited amount of data located, one could not be overly selective (i.e., essentially all available data was used). Obviously, it would have been preferred to have had an abundance of data for a wide range of typical shells fired under a wide range of known conditions. Nonetheless, the amount and type of data (136 measurements for spherical shells) is felt to be sufficient to establish approximate averages of peak mortar pressure for spherical aerial shells as a function of their size. This short article was prepared in the hope that some readers would find this data useful (or at least interesting). An investigation of an unfortunate accident involving indoor pyrotechnics was completed a little while ago. This article was written in the hope that by suggesting a trivially simple step, similar accidents might be avoided in the future. The morphology (size, shape and surface features) of the constituent particles in a pyrotechnic composition affects its performance. While this is particularly true for high melting point fuels and oxidizers in the composition, to a lesser extent it is also true for those with low melting points. Particle morphology also constitutes an important part of establishing the likelihood of a forensic match between evidence and materials of known origin. This article catalogs and briefly discusses some morphologic features often associated with some of the most commonly used low melting point oxidizers in pyrotechnic compositions.